The Gaorangers are back in action! And this time, teaming up with the ninjas of Hurricaneger. Ninpuu Sentai Hurricaneger vs Gaoranger is now available subbed for your viewing pleasure from Gao Soul Forever! Ninpuu Sentai Hurricaneger vs Gaoranger happens in after the events of Hyakujuu Sentai Gaoranger tv series. 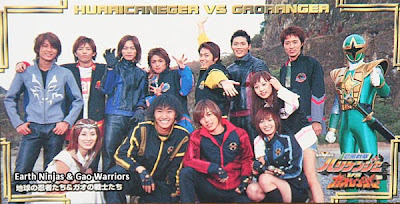 The Gaoranger were kidnapped by Tsuetsue and Yabaiba and the Jakanja took their G-Phones and disguised as them against the Hurricanger and Goraijer. What will happen to our heroes now? Will they ever beat Jakanja? Find out by downloading Ninpuu Sentai Hurricaneger vs Gaoranger from Gao Soul Forever Fansubs! Completely subbed Hyakujuu Sentai Gaoranger can also be downloaded from their site. For Ninpuu Sentai Hurricaneger subs, check out Skewed Studios Fansubs.